Duplicate files are annoying; they waste space and cause confusion. 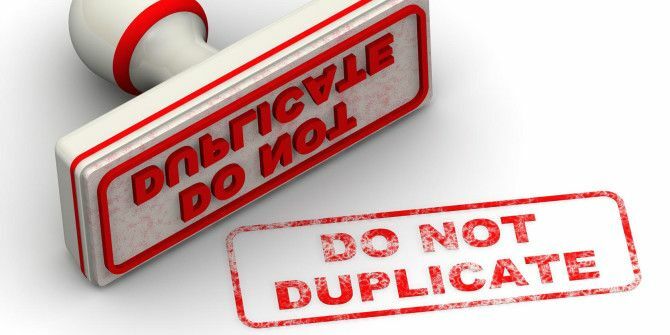 We’ve shown how to delete duplicate files in Windows Delete Duplicate Files Quickly With These Tools Delete Duplicate Files Quickly With These Tools One of the fastest ways to clog up your hard drive is to store duplicate files. Most of the time, you probably aren’t even aware that you have duplicate files. They come from a variety... Read More if you use local tracks, but you can easily clear dupes from Spotify playlists too. Using the Spotify DeDuplicator, you can find and remove duplicates in any Spotify playlist, and it doesn’t even require logging in with your Spotify account! Open any Spotify playlist and press Ctrl + A to select all the tracks. Then, press Ctrl + C to copy them and Ctrl + V to paste them into the top box on the DeDuplicator page (or just drag and drop them between the windows). Now, you just need to press the DeDuplicate button on the page and it will spit out a list of tracks without duplicates! Make a new playlist (to keep the old one intact) and copy/paste the new track list back into Spotify. You might get an error message if you try to drag and drop from the site into Spotify, so copying and pasting the tracks is safer. This works great for massive playlists Discover New Music with Spotify's Automagic Playlists Discover New Music with Spotify's Automagic Playlists Spotify has recently released several new ways of generating unique playlists that will help you discover awesome new music. We're here to guide you through these automagic playlist makers. Read More (the old Starred feature, for example), and comes in especially handy if you’ve been a Spotify user for a while. Spotify now warns you when you’re about to add a duplicate, but in years past you could create duplicates without warning. Note that this method will only remove exact duplicates. If you have two of the same track in a playlist, but one is from a Greatest Hits album or a single, for instance, it won’t see them as a dupe. And if you’re curious, you can use Diff Checker to show the differences between the two DiffChecker: Find Text Differences Between Two Files DiffChecker: Find Text Differences Between Two Files Read More sets of tracks to find out which ones were duplicated. How many duplicates did you find in your favorite playlist? How many tracks are in your biggest playlist? Tell us in the comments! Explore more about: Declutter, Playlist, Spotify.